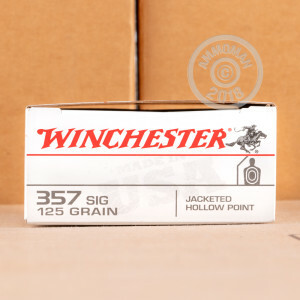 You'll have great protection, and lots of it, with these 500 rounds of 357 SIG ammunition from Winchester! These 125 grain jacketed hollow point rounds have what it takes to deliver a lethal shot that your attacker will not escape from. These rounds are designed for maximum expansion after they penetrate your target, creating a vast wound. 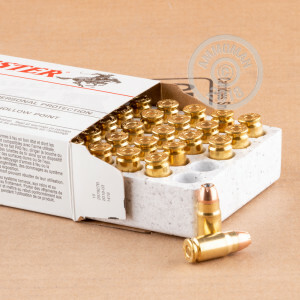 Each cartridge is Boxer-primed and brass cased. They will load smoothly into your firearm and fire consistently with each round. They are also designed to have less recoil, which is key when the accuracy of your shot is so important. This ammunition is reloadable and non-corrosive. Buying in bulk will save you money per round, as well as qualify you for free shipping. 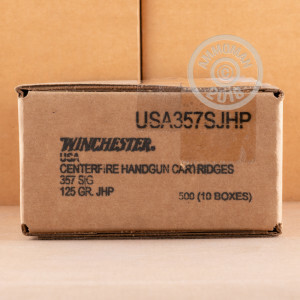 Trust industry leader Winchester to keep you protected with this self defense ammunition. Order your 500 rounds today!